17 09 08 - 13:02 When I was going to Poland for exchange studies, I had with myself an ancient, bone-crushingly heavy laptop for typing essays and whatnot. That relic of a computer featured a black%white screen, a highly unresponsive keyboard, and a disturbingly slow 386 processor that barely ran DOS and Windows 3.11 (and looked like this). Before the trip I downloaded a few games for it, to keep me entertained in that strange country I knew next to nothing about. The time in Poland was awesome (in fact so awesome that I went back there a year later! ), but I did find some time to try out the games, too. I was happing to find that I had made some excellent choices - and one of them turned out to be The Very Best Computer Game Ever Made! An excellent dungeon-dwelling RPG that started the enormous roguelike class of games. 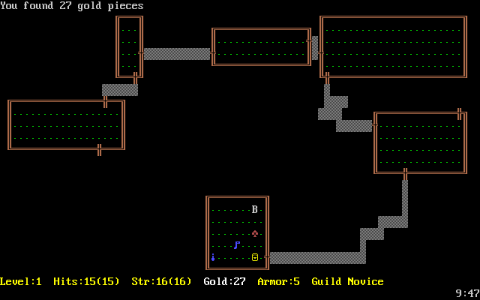 I had to pick this over its mightier follower Nethack, as my screen didn't show colours, and none were needed for Rogue. I was proud of actually finding the legendary amulet of Yendor, but never had the time to make the trip back out of the dungeon. Maybe one day..? You can play Rogue online over here, or you can download the original from here or here. An extremely fun life simulator. I made a post about its online version some time ago. Commander Keen, one of the best platformers, and everyone's favourite some 20 or so years ago! Evil Vorticons are planning to destroy the earth, and only 8-year old Billy Blaze, alias Commander Keen can save us. This series is a true classic! You can download the first episode from here and purchase the rest from iD Software. THIS is The Very Best Computer Game Ever Made! It's phenomenal, it's astounding, it's gorgeous, and it's incredibly addictive! And it's damn controversial too; it's the worlds first and - as far as I know - only game in which you play a reckless pyroman, burning down famous buildings such as the Louvre Museum, the Congress Library, Kreml, Buckingham Palace, AND various famous people such as the queen of England! Pyro 2 is a puzzle game at heart; your task is to run through the building, unrolling a ball of string (already lit from its end!) and dropping/spilling gas canisters all over the place, and to escape in time before the fire reaches the gas, exploding the place into a deadly inferno. As you can see, the game is bloody ugly. Well, the graphics are really plain, but functional. It's the gameplay that shines, though; everything works at a 100% accuracy, making the game an absolute bliss to play! Hi. This is a good article. Where i can find more information about this ?